Now, The Music Store has grown to 5,000 square feet and houses 11 teaching studios with 20 teachers. We have one of the largest and best selections of sheet music in Arizona, 16 guitar and amplifier lines, band and orchestra instruments, accessories, rentals, and a repair shop. We also provide online shopping, teacher workshops, sheet music research services, and news updates via e-mail news blasts and event invitations (subscribe below), Twitter, and Facebook. Over time, The Music Store has expanded greatly. However, we have maintained our commitment to exceptional education, quality products, and excellence in service. We consider ourselves to be your partner in music education, whether you are a teacher, director, parent, or student. Visit us and become a member of The Music Store family. We look forward to serving you. 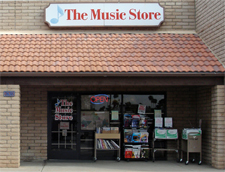 The Music Store is blessed to be graced with a staff comprised of multi-talented musicians from a variety of musical genres, each with an extensive broad-based music background and an area of specialty. For example, in our sheet music department, you will find staff members who specialize in classical piano, flute, clarinet, violin, cello, vocal, and keyboard performance. Several of these staff members are working toward their music education degrees, others have already graduated. Each participates regularly in music whether in a band, chamber group, educational, or a sacred setting. In our instrument department, you will find staff members who specialize in guitar, bass, percussion, upright bass, and piano performance. Some are still in school, while others have completed their educations. All participate in bands or sacred settings. Each member of our staff has a wealth of knowledge and experience in music, which they use to assist you in your quest for instruments, print music, lessons, rentals, or repairs. We pride ourselves in being able to answer your questions, even if we have to research them, give you honest, trustworthy advice, and make you feel like you have the support of family with every purchase. We look forward to making you a part of The Music Store family. The Music Store is always accepting applications for friendly and knowledgable staff. Applicants must be able to read music well. Applications and Questionnaires may be dropped off at the store, faxed to 480.831.1964, or emailed to hr@the-music-store.com. To apply, please fill out both the Application and the Questionnaire. Applications and Questionnaires are also available in-store. Must be able to promote classes.